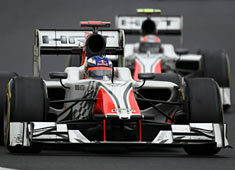 At Hispania Racing Team the drivers had very differing race performances. Tonio Liuzzi first broke his front wing and later on was unlucky with the moment of the safety car. Daniel Ricciardo had a nice race and managed to finish in between the Virgin F1 cars. "It was a good day’s work by HRT F1 Team at the 16th Formula 1 World Championship GP which took place at the Korea International Circuit today. After having little time to work on set-up yesterday and having faced technical problems on one of the cars, the team worked magnificently both in the garage and defining tyre strategies which ended up being a key factor in the race. This hard work paid off as Daniel Ricciardo completed an excellent race, in which he maintained a quick and consistent pace, finishing in 19th ahead of D’Ambrosio. Vitantonio Liuzzi had a good start but an incident on the first turn forced him to come into boxes before expected and ultimately affected his race. He ended up finishing in 21st. Only the blue flags and safety car stopped Ricciardo and Liuzzi from ending up further up the field." “We had a really good start, we overtook a few cars and heading into turn 3 there must have been some contact because there were pieces of carbon flying. I hit something with my front end and after that I had problems locking the front which caused my contact in turn 4 with one of the Virgins. After that I damaged my front wing and was forced to come in which killed my race. We had pretty good pace during the first stint but the safety car came out at the worst time possible, just as the leaders had lapped me, so I was a lap down with respect to my main rivals. The race was very difficult after that and the balance was all over the place, it was really hard to drive. But with all those problems we endured, we still made it to the checkered flag which is a positive thing”. “We had a good race, it’s nice to finish considering the weekend we had. We had a strong pace throughout the race and had a good fight with the Virgins so that’s two consecutive races where we have been much more competitive with them so we have to be happy about that. I’m a bit disappointed with myself after the safety car because I went to attack Glock but it worked against me with D’Ambrosio getting past me. That made me work hard to get back past him again so, at least we split the two Virgins. Next time we have to work hard to get ahead of both of them”. "Overall, today I'm quite satisfied with how the race went for us. We only had yesterday morning session to set the cars up, especially Daniel's one after the engine issues. The tyre management was going to be key during the race and the team has done a good job. Daniel was faster than D'Ambrosio and even Glock at some stages, fought them and completed a highly competitive race. He has done a very good job and only the traffic management prevented us to finish ahead of both Virgin. It was a shame that Tonio had to pit earlier than we had planned as a consequence of the first lap incident because that, and the safety car, burdened him for the rest of the race. Otherwise I think he could have finished further up. We have been fast and consistent and, on top of that, it is also positive that the difference with respect to the leaders has been the smallest so far this season .It was our best race in terms of performance. We have to continue in this line for the remaining three ".